When the phrase ‘unprecedented among Western democracies’ is used in a derogatory manner you can usually be certain that it’s a story involving everybody’s favourite perma-tanned, Just for Men fan Silvio Berlusconi. The story in this case centres on the Italian prime minister’s government pushing through new measures that would give the state control over online video content and force anyone who regularly uploads videos to obtain a license from the Ministry of Communications. The new measures are expected to get final Cabinet approval on 4 February unless opposition parties are able to block them in court. The government’s main target is Google, which is in an ongoing battle with Mediaset (Berlusconi’s media network) over copyright revenue for network programming that winds up on YouTube. The new rules would require internet service providers to remove content the state deems is in violation of copyright law, or face a fine of around €150,000. This entry was posted on January 25, 2010 at 10:49 am and is filed under News. You can follow any responses to this entry through the RSS 2.0 feed. You can leave a response, or trackback from your own site. This is why I think that politicians should be regular folk. By that I don’t mean your typical white-van-man, I just mean someone with a pretty decent education in a valuable field (not political science, not PR, not theology, not hair and beauty). I don’t like the fact we claim to be democratic, yet in the end the same rich assholes (see: this guy, Bush), and ‘royal’ families in control (see: The Clintons, The Bushes), or the same two parties in charge over and over (see: Labour, The Tories, The Republicans, The Democrats, etc). We’ve moved from having one set ruler, to two, in most western nations, and a lot of them are still the same old characters that used to run the show. This is another example, and it’s seriously going to drag down the net. That’s some heavy thinking before you’ve even had a mid-morning coffee. I see you point though, even in Ireland there’s been complaints that those in charge of communications haven’t a notion of what they’re doing, and I’d say if you looked hard enough at the qualifications of those around Europe who have the ultimate power when it comes to comms (the ministers, junior ministers) most will be glorified civil servants with a facebook account. 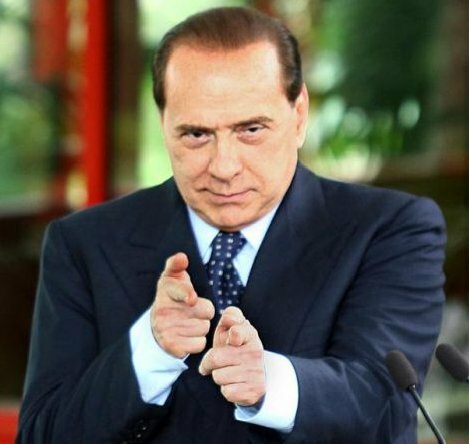 This particular move by Berlusconi though seems to be motivated more by his own personal profit rather than any ignorance. If anything he’s very aware of the power of the net considering his media interests. The move would be a target for scorn in most countries in the EU anyway. Still, a bloke with a hair weave (allegedly) and penchant for ladies of the night (very allegedly) hardly cares what anybody thinks of him now.